Love the grey/tan look here. This is a full colour shot so I hope it doesn\'t seem too much like selective colouring (although if the voter\'s like it, then that\'s just fine ;-). Congratulations on your top 20 finish with this lovely swing. Awesome photo Irene!!! Those mirror reflections are amazing! This is another one where 6.4 seems a bit underrated. I'm really bowled over that this didn't come higher up, I thought it one of the best photos in this challenge. Great job and a creative diversion from your always masterful stop-action shots. Congratulations. Very nice focus and clear shot. Good job. Im loving the tone of the chees peice. it has a nice classic feel to it and a modern color scheme. I somewhat wish that the balls were more in focus but this def. leads your eye to the Best peice of action in the shot. nice work. great job with controlling the exposure. I see you...well, kind of. ;^) This is a creative take on the challenge. Nice rich tone in the chess piece. Could be my monitor, but the white background looks pixelated and splotchy. Almost wish I could see the rest of the reflection in the glass. You know what would have worked really well here is a black background where the tabletop and background could have blended together more and eliminated that line where they meet at the table edge. Just a thought. Best of luck to you in the challenge. "Great Job" from the "Great Job Baggie"! The mirror image in this is a very good idea in order to capture the full movement of the subjects! I enjoyed the chromal tones in this, the background and the ball thingy (for lack of knowing what it's really called). The woodtone in the chess piece against this chromal tone shot really stands out, and really highlights where the action is taking place. In regard to the action itself, it is a very creative shot to get this timed right. What I think I love MOST about this shot is the angle that the chess piece is at, and the reflection of the bottom of the piece. I'm upping my score from an 8 to a 9. Nice composition and reflection. 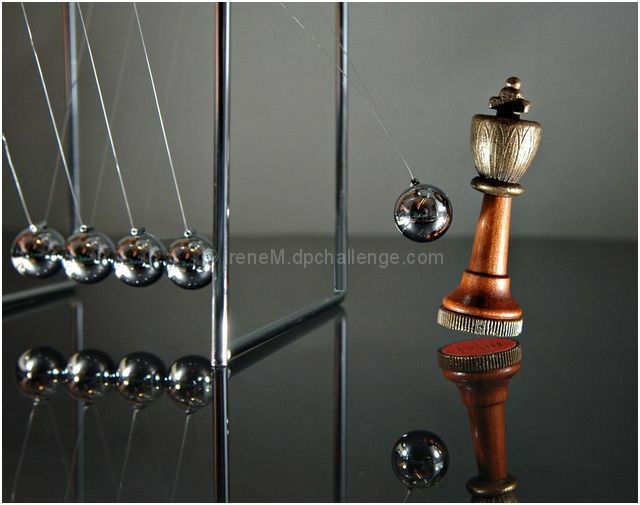 I like the way the color in the balls is similar to the chess piece. I like this. It is original, it is clean, with both good exposure, and no hints of a motion trail. The reflection really adds to it. congratulations on a great photo! very slick idea. turned out nice. Proudly hosted by Sargasso Networks. Current Server Time: 04/24/2019 03:50:30 AM EDT.